Lately, tile kitchen countertops are starting to look surprisingly modern. Once a kitchen stable throughout the 70s, 80s, and 90s, these days thrifty homeowners see tile as an affordable alternative to more expensive counter materials such as quartz, marble, and granite. Even better, anyone with basic do-it-yourself skills can install tile. In fact, we found a DIYer who covered her old laminate counter with new tile (more on that later in this post). So if you are looking for creative ways to refresh your cooking space without going broke, behold these 18 tile kitchen countertops. A retro-flavored cooking space by Seattle Custom Cabinets situated in the Pacific Northwest pairs a hexagon tile countertop with a subway tile backsplash. The winning combination boosts visual interest by adding contrasting patterns to the mostly white kitchen. Over the sink area are two vintage inspired milk glass pendants lights. The range is a vintage Wedgewood double oven from the 1940s. Ditch those straight lines in your kitchen with curved construction tiles. Doing so will ensure that a floor to ceiling tile pattern is not disrupted by sharp angles as shown in this small kitchen by DTILE based in the Netherlands. Even the tiny sink is covered with square tiles. Dove gray grout enhances the modern layout. Gorgeous ocean green tiles perk up an old kitchen in a vintage California home spotted on The Home Company. The new countertop and backsplash refresh the cooking space without detracting from its old-timey appeal. The Wedgewood range dates back to the late 1940s. The butcher block kitchen island is another new feature. The flat-front cabinets are an original home feature. Handmade square yellow tiles are a lovely rustic touch in this cooking space by New York City based DHD Architecture. Tiles like these are best suited for countertops that are not subject to heavy-duty wear and tear. In this kitchen, a countertop consisting of square porcelain tiles in a pale color called brick orange are paired with a brick styled tile backsplash. Designed by Sara Ingrassia Interiors based in Los Angeles, California, the tiles in warm hues make the small cooking space feel extra cozy. A marble hexagon tile countertop makes a stylish first impression in this Swedish kitchen feature on Fantastic Frank. The backsplash is affordable builder grade ceramic tile. It is your kitchen after all, so it is perfectly ok to get mighty creative when tiling your cooking space. This custom kitchen features countertops covered with baby blue tiles. The cubby storage adds even more functionality into this stylish yet practical open concept room. The kitchen is by DTILE situated in the Netherlands. We mentioned at beginning of this post that it is possible to cover a laminate countertop with new tile. Here Timisha, the blogger behind Tool Box Divas gets the job done using marble floor tile — ingenious. Her super smart DIY shares everything you need to know from the best tools to use, and the must have tiling products for creating a watertight seal. Porcelain tile is ideal for hardworking kitchens. How so, you might be thinking? The material is made up of different clays and minerals that when fired forms a very durable surface that is much harder than ceramic. 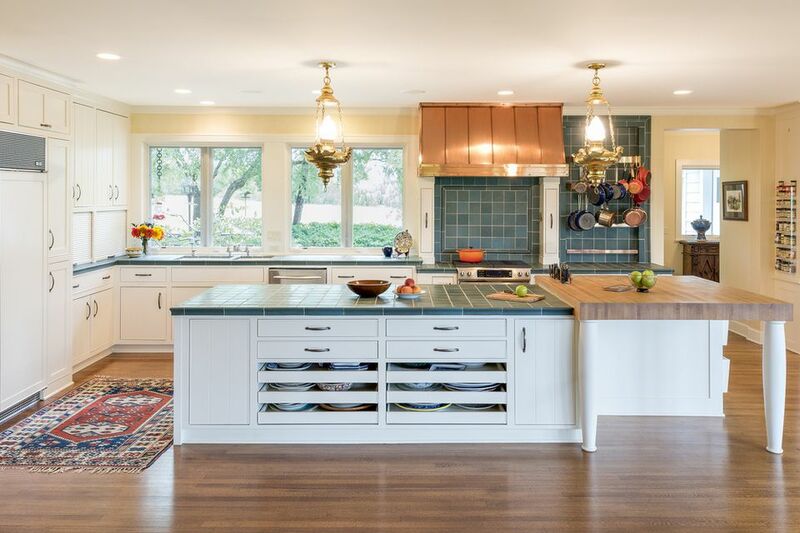 In this traditional cooking space by Lind Nelson Construction out of Wayzata, Minnesota, porcelain tile covers the counters and backsplash. The lovely green tiles coordinate beautifully with the copper over hood and butcher block kitchen island. Tiles come in different sizes and shapes. Schluter Systems L.P. located through the U.S., installed large-format tiles in this cooking space to eliminate the number of grout lines that come with using much smaller options. Terracotta tiles warm up this white kitchen by Marazzi, out of Sunnyvale, Texas. Covering the floor, countertop, and backsplash in the same material creates a seamless appearance. Slate tile is the not best material to use for kitchen countertop because it can etch and chip easily. With that said, it can work in a kitchen like this one that does not get a lot of use. Sal DiBlasi, Elite-tile Company, located in Boston, Massachusetts shares a time-lapse video of the installation. Chocolate brown flat front cabinetry and cool gray tiles make this contemporary kitchen by the Dutch company DTILE feel incredibly modern. Both features pop against the crisp, white wall. These gorgeous tiles are 100 percent handcrafted and hand cut. They add a rustic European touch to this kitchen countertop seen on CLE. Our hearts almost skipped a beat when we saw this pretty little kitchen by The Platform Experiment, a home staging company based in California. Topping off the countertop are authentic Mexican tiles. Here is another instance of how you can use tile to makeover an old and ugly laminate countertop. The best part? This project cost around $40. Even better, it took a single afternoon to finish the job. Lifestyle blogger Jenny Steffens Hobick provides all the details here. If you lack the confidence to get started, she suggests watching a few tiling videos on YouTube. You may not have guessed that everything in this cooking space is brand spanking new. Jackson Design and Remodeling based in San Diego, California went with a tile countertop because it worked with the kitchen's retro theme. The yellow range is Big Chill. The checkered floor is Marmoleum. We adore this tiny square tile kitchen countertop seen on Burke Decor. These fun size tiles add texture and pattern to the modern cooking space. They are also easy to install thanks to a mesh backing. It eliminates the chore of hand laying each tile.